Hey everybody! 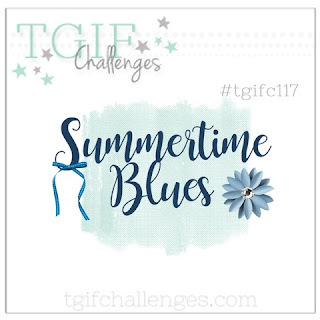 I'm back today to play along with the #TGIFC117 and this week they've got a Summertime Blues challenge. Summertime Blues? Well, for me it's summertime blue skies and sunshine! Summertime for me is about enjoying the beautiful weather, soaking up some sunshine and maybe even picking some flowers. 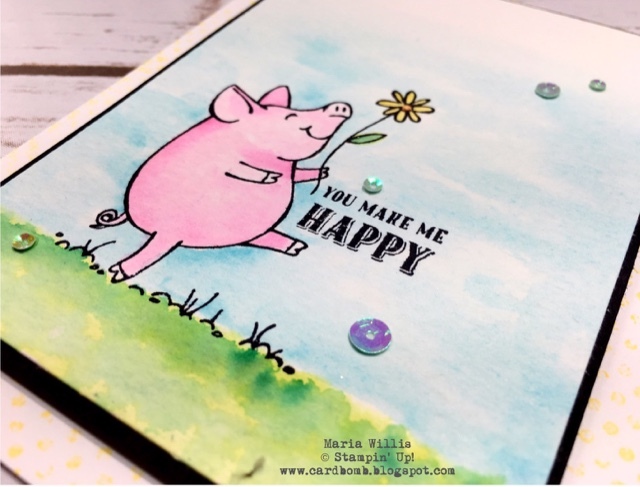 That being said, this adorable pig stamp was just perfect for this theme. I stamped my image from the This Little Piggy stamp set in Basic Black Archival ink so that I could watercolor without worrying about my image smearing. The Archival inks are my favorite permanent inks for just about everything. Remember that when you are watercoloring it is critical to use either watercolor paper (that's what I've used on this card), or, Shimmery White Yardstick so that your colors will blend and your paper won't warp or pill. I used Lemon Lime Twist and Emerald Envy on the grass, Berry Burst on the pig, Daffodil Delight and Pumpkin Pie on the flower and Tempting Turquoise for my "Summertime Blues" sky. The new Iridescent Sequins are so awesome. I love that they come in many different colors and sizes. If you look closely at the center of the flower you might be able to see that I've adhered the center of an orange sequin to the flower. In real life it sparkles just a bit. I wanted to keep my card simple to highlight the fun image and the watercoloring but when I added the image to my white card base it seemed like something was missing. I added a tab to the side using my Bermuda Bay Chevron ribbon so that there would be just a pop of color peeking out. I also used the polka dot stamp from Timeless Textures to create a fun background in Daffodil Delight (stamped off once). I was hoping that it would add to the sunshiny, summer look of the card. If you'd like to see some more Summertime Blues themed cards then head on over to TGIF Challenge Blog to see what the design team and challenge participants have created. There are some really amazing projects so I recommend checking them out. Thanks for stopping by my blog today! It's always so nice to have you visit.